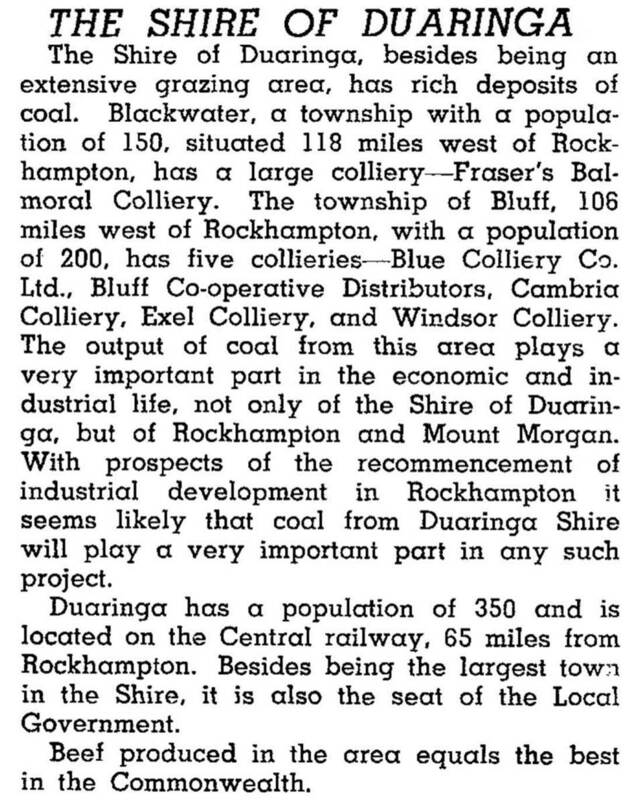 Duaringa, a rural town on the Capricorn Highway, is 90 km south-west of Rockhampton. The origin of the name is obscure, possibly from an Aboriginal expression or based on the name of an early resident, Inga Anderson. In 1867 an inland railway from Rockhampton to Westwood was opened, and nine years later it was extended to Boollburra, a few kilometres east of the site which from that time was named Duaringa. By 1879 the railway had gone on to Emerald, crossing what became Duaringa Shire. The presence of the railway was accompanied by an influx of population, and the supervising local authority, the Banana Divisional Board, requested the severance of the Duaringa area. In 1881 the Duaringa Division was proclaimed. In the late 1950s Bowen Basin coal deposits were investigated, and various open cut mines were opened around Blackwater in the next few decades. Most are outside the shire, but Blackwater became their dormitory town. Railway line branches were opened to Cook and South Blackwater mines (1970), Gregory and Oakey Creek mines north of Blackwater (1979) and the Curragh open cut (1983), the last-mentioned being in Duaringa Shire. There was also considerable clearing of brigalow country under a development scheme begun in 1962, particularly north of the Capricorn Highway. Duaringa's Country Women's Association hall (CWA) was put up for sale in 2014 following declining membership. The shire's main population centres were along the Capricorn Highway, in particular, Blackwater where the council offices were located. About 50 km south of Duaringa is the Woorabinda Shire, formerly Woorabinda Aboriginal community, established in 1927 when the Taroom settlement was removed from the Dawson River irrigation scheme. In 2008 it was amalgamated with Emerald, Bauhania and Peak Down Shires to form Central Highlands Regional Council.